The MARAC Nominations & Elections Committee, (Alan Delozier, Tammy Hamilton, Dan Horvath, Jenny Kinniff, Dan Linke, and Matthew Strauss), with the assistance from the MARAC Administrator, Tammy Hoffman, and MARAC Chair, John LeGloahec, wish to thank the members who participated in the recent election to determine our newest incoming officials. A total of 40 candidates competed for the offices of Treasurer, Secretary, Finding Aids Award Committee, Arline Custer Award Committee, Nominations & Elections Committee, and all of the State Caucus Representatives. The Committee especially thanks the candidates who ran for these offices. When the tallies were completed, we had a total of 436 votes recorded, which is an all-time record, eclipsing the 377 ballots received last year. With all ballots received and verified, the Committee announces the winners of the 2014 MARAC Election. The Technical Leaflet Series “is intended to provide brief, practical information about selected archival topics suitable especially for beginners in the profession. “ The Technical Leaflets continue to serve as introductions for new archivists, archivists working with new formats, and solid principles on many topics. Analog photograph formats present a variety of challenges to archivists: housing and storage, handling, identifying deterioration, and understanding the physical construction and chemical composition of a variety of processes. This leaflet provides a brief introduction to a complex chemical process that has undergone rapid change and innovation during its relatively short life. The simple yet solid advice is applicable for most organic archival material, but is presented with specifics on how environmental hazards affect the unique chemical composition and physical structures of photographs. Topics include improper storage environments, poor quality housing, inappropriate handling, biological attacks from pests and mold, processing faults, inherent flaws, and exposure to light. These practical measures are still in use; updating in this leaflet would largely focus on including a section on digitization of photographic materials and the inclusion of new funding resources available for photograph preservation. Anyone with a gap in their archival repertoire on photographic materials would be well served to include this basic introduction in their early reading. A digitized version of this Technical Leaflet can be found at http://www.marac.info/publications. With more and more institutions focusing on their archives and special collections as their unique holdings and greater investment in public history and programming, exhibitions featuring archives, manuscripts, rare books and printed material are major vehicles of public service. This leaflet covers major areas of exhibition preparation and installation in broad strokes; curators of analog exhibitions would no doubt have additional questions on planning gallery space, working within a limited space, and creating a logical flow. The leaflet needs updating to reflect innovations in analog exhibitions (the inclusion of multimedia, for example) and digital exhibitions that necessitate some understanding of web design and writing for the web. Providing examples and resources for a dynamic medium is always tricky, but resources on basic principles of good web design, etc., would be useful. As a whole, however, the leaflet still provides basic practical advice applicable to all levels of experience: evaluating preservation issues, designing engaging layouts, and creating exhibits on a budget. With greater influx of collection material, increased demand for materials to be made available more quickly, and rapidly changing formats in need of timely intervention and migration, many archivists are planning large projects. Large projects that involve time, money, people, communication, and measurable outcomes for the investment(s). This leaflet provides a very basic overview of how to plan, whether it’s for a project or for an entire archival program. More attention is being paid to project management approaches to processing and other sorts of projects within a repository; this leaflet outlines some of the first steps of project management: define your project; analyze current resources; formulate goals, objectives, and activities; and implementation of the plan. This is a broad approach to planning a project or planning an archival program that is applicable to many different situations. With advice to understand the plan is flexible, buy-in from all parties is essential, and deadlines and deliverables must be met, this leaflet remains a great go-to. These two neighborhoods offer great eats and drinks on a budget! John’s Tex Mex on South Avenue in the South Wedge area can fill any desire you have for great Tex Mex. You can sit outside or inside, either way you’re in for a treat. If sandwiches are what you crave stop by Open Face, which offers great vegetarian and vegan options. Don’t have time for sit down? Pop in the Mise en Place Market where you can carry out or sit at one of their high top table and watch street traffic. Satisfy your craving for sweets with a visit at Hedonist Chocolates for bite of heaven, or Cheese Eddies for a great variety of cheesecakes and other treats. Looking for a happy hour hang out, then head to Tap and Mallet on Gregory Street for good eats and locally craft beer. Or head over to Lux Café for your night’s entertainment. Drawing its name from the tannery that used to run next to I-490 in the 19th century, Swillburg is an off the beaten path neighborhood with great diners and international options. Compare the grub at Highland Park Diner and its near-by competitor- the South Wedge Diner. If you chose Highland Park Diner, be sure and save time to see a double feature at The Cinema across the street. On South Clinton Street, you might try Shiki Japanese for great sushi, or Lilu Café & Ethiopian. You’ll also find the India House, which offers a great lunch buffet as you get ready to hit the road after the last MARAC session on Saturday. Join us this WEDNESDAY, April 16th for a NEA spring meet-up at the Church Restaurant in the Fenway. We’ll start to gather around 5:30-6:00pm on the club/bar side of the restaurant, so close up your reading room or give yourself a study break and come join us. There will be nibbles for your delectation and you can take advantage of the bar as you wish. Bring your friends, coworkers, and even interested researchers along with you to enjoy conversation, snacks, and the incredible spring weather. (NB: there’s limited on-street parking or you can take the Green Line (D train) to the Fenway stop and it’s an easy walk). Located just north of the East End neighborhood, NOTA is a cultural center of Rochester. 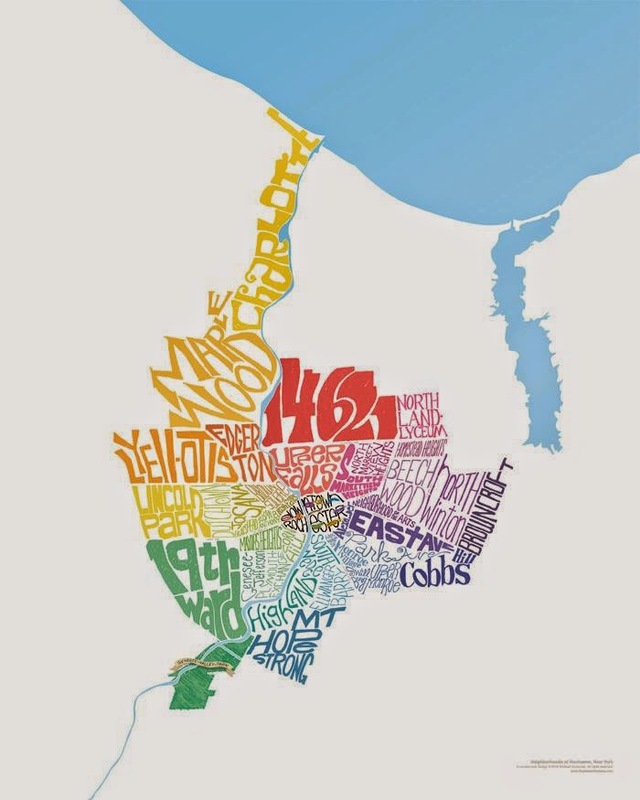 Only 15 city blocks long and three blocks wide, this district packs in more museums, cultural institutions, art schools, galleries, and studios than any other neighborhood in the Rochester metropolitan area. Turn-of-the-century single-family homes are neighbors to restaurants, cafes, gift shops, and dance and artists’ studios. A variety of artists maintain studios in the Anderson Alley cooperative and Village Gate Square. Just across the street, the Memorial Art Gallery features cultural treasures from around the world. The George Eastman House International Museum of Photography & Film is just a short walk down University Avenue. Budding and professional writers alike frequent Writers and Books, the city’s literary center. The Multi-Use Cultural and Community Center (MuCCC), housed in a 1888 mission-style church building, features eclectic performances and offbeat entertainment. Tying it all together is ARTWalk, a permanent urban art trail connecting the arts centers and public spaces within the Neighborhood of the Arts. Thursday, April 24: Espada Brazilian Steak at The Village Gate, 274 N. Goodman Street.(585)473-0050. Bossa Nova Jazz featuring The Charles Mitchell Group. 6 pm. Free. Friday, April 25: Baobab Cultural Center, 728 University Ave. (585)563-2145. Community Dialogue Series: Last Friday Jazz Heritage Series. 7 pm. $10. The Last Friday Jazz Heritage Series presents fine performances of jazz and provides audiences with the opportunity to engage in a dialogue on its history, sociology and psychology in the United States and throughout the world.